Did you know about Vet 24 emergency vet fee cover? FREE with Pet 24 membership! Here's a fab pic of Scoob and Sam. Sam did 'a runner' ....he was thankfully found safe and unhurt, then taken to a local vet's practise where the call was made to our 24/7 Pet 24 team in Cambridge-they then notified a very relieved owner, who picked Sam up shortly after the call. It's so important that missing dogs are reunited with their owners as quickly as possible, in order to minimise the stress they will feel-not to mention that of the owner. One of our fantastic partners, Dogs Trust, knows only too well the importance of keeping their rescue dogs' stress levels at a minimum where possible, which is why all dogs they re-home leave their centres wearing a LIVE lost-and-found yellow Dogs Trust tag, which is serviced by Pet 24. Thankfully, on this occasion Sam was found uninjured. 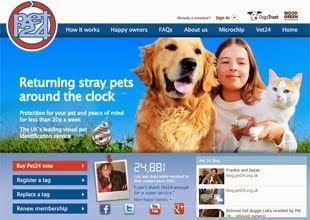 Did you know that as part of the Pet 24 membership (£15 a year or £40 for 5 years) your dog will also be covered by Vet 24? Vet 24 gives emergency vet fee cover of up to £750 should your dog be found injured. It's fantastic value for money, bringing great peace of mind to our dog owners and is one of the main reasons that people stay with Pet 24 year after year, including of course the knowledge that their dog's tag ensures a quick reunion with their owner, should their beloved dog go missing- just a phone call away! Our customers also love the extra information that they can give Pet 24, including other family members' or neighbours' phone numbers and information about their holidays, when many dogs go missing. Many thanks for the great picture Jackie...and the whole team wish both doggies a long and happy life. Pet 24 and Agria Insurance provide a speedy return for the intrepid Archie! Archie, our 6 month old border is happy to go along with my husband when he is out and about working. In fact he has built up a team of admirers who take turns in supervising him as well as supplying a steady stream of treats! Unfortunately a minor lapse in supervision resulted in our adventurous young pup making a bid for freedom and he escaped through a partially open gate. Our intrepid explorer made his way across a car park and behind the back of the local shopping centre. Following his instincts and no doubt his nose, Archie found his way to the local butcher's shop. The butcher's boy was interrupted from his sausage-making duties to find two doleful eyes looking up at him. Fortunately he resisted the begging looks and phoned the Pet 24 number immediately. Much to my husband's relief, Archie was returned within 20 minutes and the search party called off. The 'Cooler King's great escape was at an end with a happy conclusion all round. Really glad we had taken up the option of having Archie tagged.